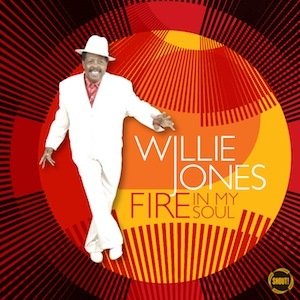 At the grand old age of seventy-eight no less, soul veteran Willie Jones debuts with his first solo album and it is very much in the old R & B school bag. For younger readers, Jones came to prominence in the 1950s as vocalist with the Royal Jukes and as a solo artist recorded on the prestigious Atlantic label among others on numerous 45s. Surprisingly, his musical career came to an abrupt halt around 1966 and a forty year gap resulted before interest was rekindled in him. Willie Jones possesses a voice which has a smooth and soft tenor disposition not unlike soul-blues singer Robert Cray in fact, though one could easily flip the coin and state that it is Cray whose voice bears a resemblance to that of Jones. Recorded in Nashville Tennessee, musician, producer and songwriter Jon Tiven has done a pretty good job of providing Jones with a soulful accompaniment, though the inclusion of rock-influenced guitars on some songs is an impediment and the horn section could do with being beefed up significantly to give it more punch. Nonetheless, there are some fine moments here and Jones voice is in remarkably good shape given the years. The vocalist excels on the mid and uptempo numbers such as ‘Troubled World’ and especially the driving ‘Your lies’ which may just about be the strongest song on the whole album. There is a little filler in fifteen songs and, perhaps, for a future album the selection could be pared down a tad. Otherwise, this is a quality release from a soul veteran who deserves to be more widely recognised. What is really required to fully appreciate Willie Jones craft is to have an anthology that brings together those precious 45s recorded under various guises so that we can hear his voice in his prime.